Late last year I was approached by fellow BNI member Jason Yates of Databar about a special event called Hear Me Run Spokane that he was involved in in our local community here in Eastern Washington. When he presented the Hear Me Run Spokane overview to me over coffee I was quite surprised and intrigued at the same time. When everything was laid out I really saw this as a good opportunity for SBM and it allowed me to work closely with Jason on a short-term project. 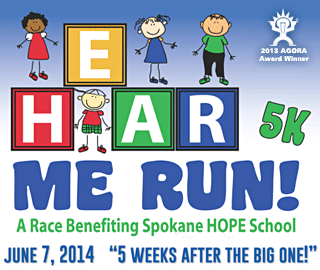 Not very often an event comes along like Hear Me Run Spokane that is both community oriented and supporting a good cause for children who are deaf or hard of hearing. This 5K run in June is set in the Inland Empire city of Spokane and Jason’s company, Databar is the firm that is overseeing all the logistics and promotion of the race. So, whether you are a die-hard runner, outdoor enthusiast or just want some family time, it’s a way that you can help a good cause and get some exercise. Some may ask – what is a local online marketing company doing for an event like this? Well my dear reader, it was not always this way in that having created, promoted and marketed special events in years past, I know how much work goes into them and the long list of details that it takes to pull off such events with few glitches. My past experience in the offline world of special events came mostly through a span of years that encompassed music and live production including staging, lights, sound and all the details within. We also dabbled in artist management for a few years and I at one time was a performing musician. From the March of Dimes Bid for Bachelors at Bellevue Square to the Redmond Derby Days to Clean Scream Events at Seattle Center, the work was massive and the hours never seem to be enough. These events and many more underneath my belt led me to take on the challenge of helping Jason and the Spokane Hope School promote this initial event. And with less than five months to get it all together, the clock seemed to be ticking at a faster pace by the day. So how are we doing this? Well, it’s no secret. We utilized a mobile platform along with a traditional desktop site, social channels and video to round off the package. As one of the initial items I brought to the table, video could help to expose the race to potential sponsors, runners, spectators and maybe even the press. Time and footage will soon tell the tale as the videos are produced and published, so stay tuned, check out the Hear Me Run Spokane Social sites and I’ll keep you apprised of the progress. Recently my daughter tried out for the regional ODP(PDP) soccer team in our state. It was a last minute decision to make the five hour tirp to the field with her having to stay overnight with another family. Needless to say upon arrival at the fields I was surprised to find that the check in was not very professional and somewhat disjointed. The coach of this new team gave us parents about two minutes of his time to basically “ask questions now” because this is the only time you have. This is the same coach that her current team coach highly recommended and maybe he is great on the field and with the kids, but his approach to us was less than charitable and somewhat brash. It has been my experience dealing with the youth soccer world that certain coaches have this attitude and this coach was no different. Now maybe he is a really nice fellow underneath the standoffish exterior. But for an estimated $2000 to $2300 over 7 to 8 months it seemed like he could have given us a little more time, or at least an FAQ handout? After all we parents do pay the bills, invest our time, drive the miles and so I feel a little common courtesy would have gone a long way. At least with me that is. In five plus years of dealing with youth soccer I have never seen a more unorganized tryout. It was like the people running it had no personal relations skills whatsoever and the organization behind them only scored a 2 (out of 10 – with 10 being highest) in my marketing and PR book. You see, as a marketer that is actively developing and growing businesses, I am attuned not only attuned to ads, slogans, headlines, colors, sayings and results, but more so the entire package. And in this case the entire package was weak and left much to be desired. So what this organization did was ‘not build up my confidence’ and for this next year they lost a great player. Yep, I’ll toot the horn for her. She really is a great soccer player and everywhere we go, parents approach her and us about her abilities and skills. She works very hard and soccer is her only sport at this stage in her life. For us first timers(at this regional level) this was an experience that I hope not to come across again in the future. Most youth sports organizations need PR and marketing people who specialize in sports marketing. These people should be up front telling the story, sharing the facts, and paving the way for the programs and leagues that are to come. It’s that simple. This is also the case for most small businesses and this is where soft selling comes into the picture..
DO NOT ASSUME that your prospects know all about your offer, your business, and how great you are. 1. You need to tell the story. 2. You need to provide the facts and testimonials(if you have them). 3. You need to be proactive and follow up with your prospects. 4. You need to provide customer service and this starts before the sale! Then I suggest you Over Communicate and Build Repore. If you market to athletes, or the youth sports marketplace – tune in for a few minutes and find the six words that could make the difference in your business or organization this next year. My observation with three children in youth sports has been that the sports organizations we’ve come into contact with have had lack luster marketing and they just don’t understand how to attract, connect and communicate. Now you would think that these so called sports marketing experts would be all over the web and also use utilizing offline direct response channels to drive business and increase awareness? Well that’s rarely the case, at least in our five going into six years of experience. This experience tells me that there could possibly be an opportunity that presents itself to your small business. The question is will you even notice it or jump on it when the little opp comes into play? One of the best ways that you as a marketer can attract more business to your enterprise or organization is simply by surveying those you come in contact with and your existing customers. This is one of the first steps to finding out what the market really wants. Now you may look at this old fashioned method or say that surveying is a hassle, but I will stand by this simple method and state that a survey can make the difference of profit or loss and success or failure. It made a huge difference in the success of The Tiny Store and over the years I’ve had clients take advantage of this age old tactic. You see, as the business owner( or manager or director) you need to find out what people want, need and desire. Not what you want, need and desire. Because it’s all about them and not you. It’s all about what they want to do, purchase and read. So you need to meet this need if you want to grow and better serve your local and regional sports community. It’s one thing to have a great idea for a product or service but it’s entirely another story to bring it to market and see long-term success. Many, many moons ago my Dad and Uncle manufactured a hard cover tennis case. It was essentially a violin case but pretty ugly and just not attractive. Now the idea was very sound, but was there a market and real need for this item or did they just concoct this idea and think it would fly and make them a gazillion dollares? Since it never went anywhere and only the samples were produced, the record shows that this tennis case ended up being a dust collector. Now I believe had they done some simple market research along with simple surveys, they might have found out just what the market needed at that time. This research may have lead to further development and even a full blown launch, but instead the ugly duckling got stuck in the attic and was chalked up as an experiment. If you already have clients or customers, then simply ask them what they want! It’s not rocket science. Just ask them over the phone, in person, by sending an email, via social media channels, or even snail mail. The bottom line is: Find the need and fill it. Soccer has been to our family like so many youth sports have been to other families throughout the world. My wife and I have had hours and hours of discussions about the sport that has dominated our household for over three years. Sometimes I feel like a sports agent having to work the phones and be out at the games, except with youth sports like soccer we parents(or financiers) have to pay to play. Fortunately for me, years ago I co-owned a management company that specialized in musicians and bands. Yeh, I know, call me a little off kilter, but having worked in that industry and been a musician myself, it made for a small business venture or so it seemed at that time. And with the amount of time and money that we’ve invested in the sport of ‘futbol’ the last five years has accumulated into the thousands of dollars, and it looks like there’s no end in sight. But the overall experience has been great for the kids as we progress with them in the land of soccer. On the one foot (no pun intended), you have my friend who played little league years ago and his Dad owned a furniture business in the town they lived in. When approached to sponsor his baseball team, his Dad refused and thought it would be a conflict of interest. Personally, I think this was short sighted on his part and showed a lack of understanding and support for the boys. On the other foot, you have our present day condition where club soccer and the associated travel have increased to the point where it’s not uncommon to pay over $300 a month in gas, club fees, tournaments, coaching fees and related travel expenses. Now there is a way that you can possibly recoup some of your outgo – especially if you are a small business owner and have an interest in youth sports marketing. As a small business owner who is looking to increase sales and revenue, youth sports might be the answer you are looking for. After all, you have a captive audience that you can continually put your name and message in front of. From logos on physical merchandise like uniforms and bags to signage, brochures, websites and emails. 1. Get to know and network with all the people that have to do with the sport your kids are playing. This includes the Owners, Directors, Managers, and Coaches of the local organization or club. 2. Offer to help at games, tournaments, and special events. This promotes good will and shows that you are looking to be involved. 3. Advertise your business and make sure to put testing mechanisms in place. This means tracking with URL’s, emails, phone numbers and separate landing pages. 4. Sponsor players, a team or teams or special event and make sure to get as much exposure as possible. To reach this target niche audience and possibly recoup some of the expenses, I believe it’s important to think outside the box and really look at all the angles. So get your biz dev cap on, your rump-a-roney in gear and look for opportunities that you can take advantage of and expand your horizons in this ever popular and growing niche. Need a little push or possibly a tip or two in addition to the ones above? Check out Small Biz Mechanix and get yourself moving in the right direction. The sport of soccer has absolutely gone bonkers in the last five years and I mean this in a good way. Our kids love to play it, we love to watch it, plus it’s a healthy, competitive environment that allows them to stay fit. With two of my three kids actively playing soccer and one playing 10 or so months of the year, it has become part of our life. No doubt about it. Many weekends we find ourselves absorbed and traveling to and from the fields until late in the evening hours. So why am I writing about soccer and small business ? Very good question – Dr. Jones…(Indiana Jones that is). You see, business development is where I’m leading to in today’s post about the world’s largest sport. Business development can occur while you are standing in line for a youth soccer match or any other sport for that matter. Business development for your small business may be right in front of you at your child’s soccer, hockey, baseball or volleyball game. Or whatever sport you and your children have chosen to participate in. Business development can be done while chatting with other parents, club directors, coaches, referees and even bystanders. #1 – If you have kids – chances are they’ll be playing soccer, even if it’s just with friends. #3 – If you are a small business owner and your little enterprise needs targeted traffic and your biz happens to fit in with the soccer demographic…NEED I SAY MORE!? Now maybe soccer isn’t your thing, your kids thing or maybe you don’t even have kids. But you are a small business owner and desire to diversify and/or expand. Opportunities for business development in the youth sports arena are popping up all over. All you need to do is open your eyes and look for them. Soccer and small business might be the right mix for your small business’ future so look for opportunities within sports like soccer. They may be right around the corner and could bring forth your next big client, service or product launch.